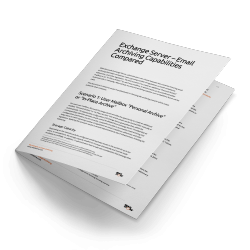 Learn more about the available email archiving options for Exchange Server. This document is meant to assist you in choosing the best archiving scenario for your company. This scenario allows you to create an additional “In-Place Archive” mailbox for each user mailbox. This scenario describes how an external archiving solution, e.g. MailStore Server, can be used. 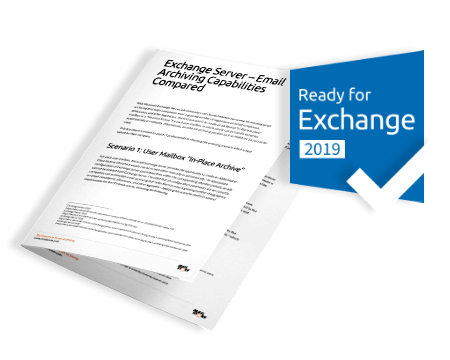 The 5-page whitepaper is meant to help you choose the ideal archiving scenario for your company and your needs. MailStore Software GmbH, one of the worldwide leading manufacturers of email archiving solutions, is headquartered in Viersen, Germany (near Düsseldorf) and is a subsidiary of Carbonite, Inc. (Nasdaq: CARB), a leading cloud-based data protection provider, headquartered in Boston, USA. Over 60,000 companies and public and educational institutions in more than 100 different countries have placed their trust in the products of this German specialist.